Well, yours truly had quite a week at work and couldn't keep up with the many news that are relevant for this blog. Let's start with the news I was very anxiously awaiting ... Command Ops: Battles from the Bulge was released! The price of the game has spurred some fierce discussions elsewhere. I will comment about that in the future. 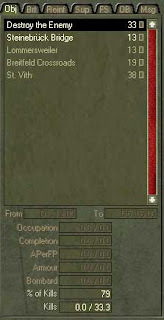 The tutorial scenario features an easy-to-win scenario for the human player playing as the Allies. Even when the scenario is not challenging, please bear with me while I plan for this battle because alas I'm not tactically gifted. Let's start the planning with a full understanding of the mission. Please make sure to click the pictures so you can actually read the text. The text paragraph on the left, just below the tabs displays the never-to-ignore briefing. It is important to read it to understand the mission. Yellow circles and writing are mine. 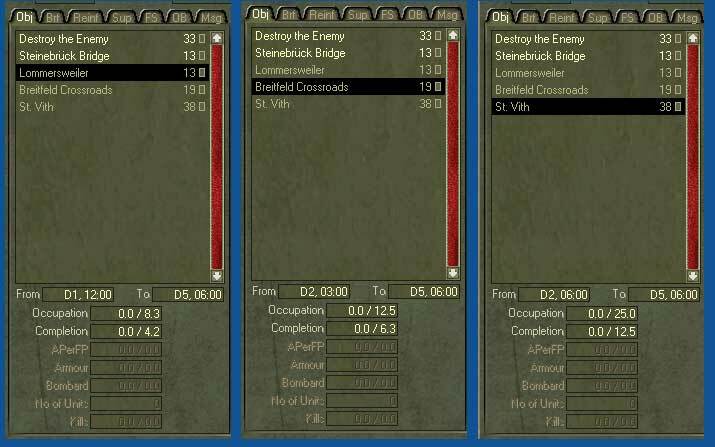 One of the other tabs shows the scenario-specific objectives. Let's take a look at those. First objective (highlighted black) is straightforward. As shown at the bottom of the screenie, if you kill 79% of the enemy force you get 33 points in your overall score. Second objective (highlighted black) is the Steinebruck bridge (for its location see full map above). Note the timing of the objective: this objective is relevant (or active) from day 1 at 0600 to day 5 at 0600. Also, there is a distinction between occupation and completion. 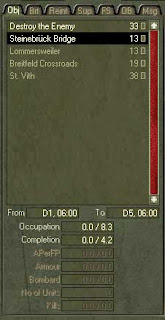 For occupying the objective (from day 1 at 0600 to day 5 at 0600) you can get a maximum of 8.3 score points. 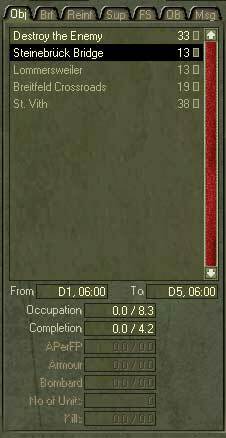 For having this objective under your control at day 5 at 0600 you will get 4.2 score points (no matter which side controlled the objective up to that time). The tabs corresponding to the other objectives are reproduced below. Make sure to take a look at the full screen and map above to get an idea of the objective's location. 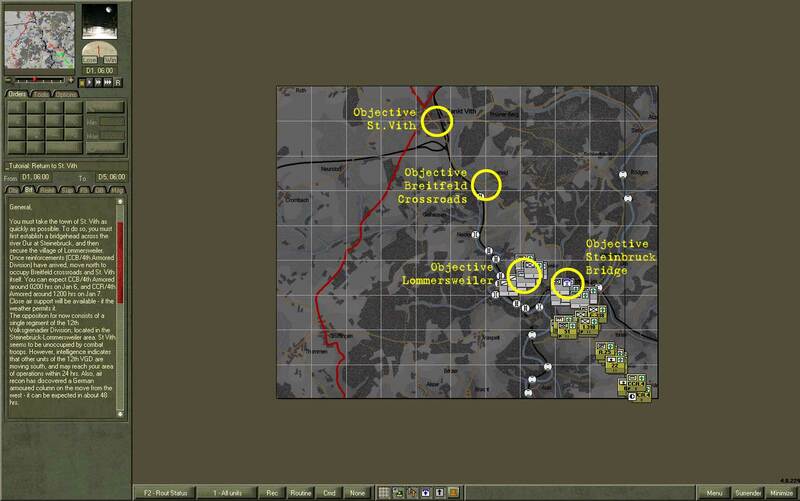 Also note how objectives Breitfeld Crossroads and St. Vith become active not at day 1 but at day 2. 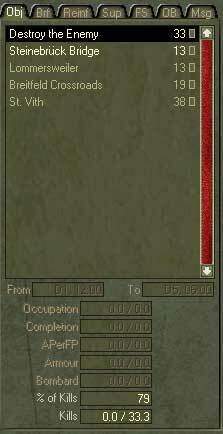 Next entry: second step of planning, the enemy.